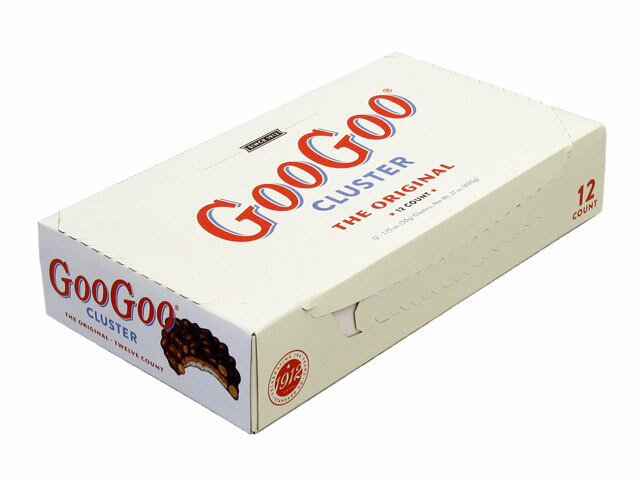 First sold in 1912 and claiming to be the world’s “first ever combination candy bar”, a GooGoo Cluster is a rocky mound of caramel, marshmallow nougat, roasted peanuts, and milk chocolate produced by Standard Candy Co. in Nashville, Tennessee. The GooGoos are as much an icon of the city as its music and have an app of their own to locate stores across Nashville that sell them. They are also quite popular in the Southern part of the U.S. with devotees as far North as Canada. 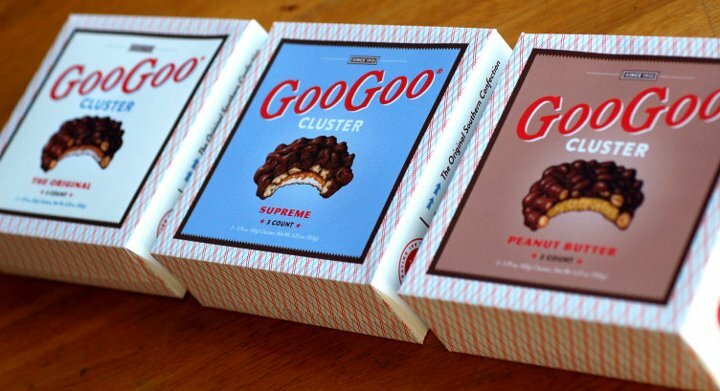 A logo and package redesign by Atlanta, GA-based Green Olive Media was introduced last year — as part of a larger effort that included spinning off GooGoo Cluster into its own company and a new recipe — but with the centenary of the candy in full swing, there is more GooGoo Cluster fever than ever. More of the old look. Were it not for the unappetizing photo of the Cluster, the previous packaging might as well have been selling motor oil. Nothing about it, from the logo to the metallic colors to the NASCAR racing striping background, conveyed comfort food or that this was a nostalgic, delicious treat. The new packaging and logo, on the other hand, ooze nostalgia and deliciousness without going over the top vintage or reaching a cloying level of Americana aesthetic. The simple, solid color backgrounds serve as a neutral backdrop for a more appetizing illustration of the Cluster and some rather nice typographic stylings — including one of my all-time favorite fonts, Frederic W. Goudy’s italic cuts of Goudy Sans. 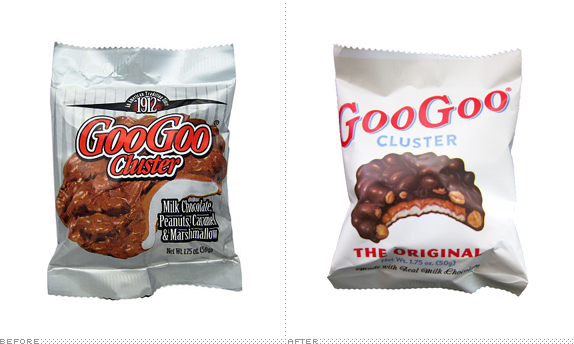 To boot, there is not a gradient or shadow in sight (other than the subtle one behind the GooGoos on top of colored backgrounds), showing that consumer packaging can do without them. Overall, a fantastic redesign from marshmallow nougat to type selection. Thanks to Dan Snyder for the tip. 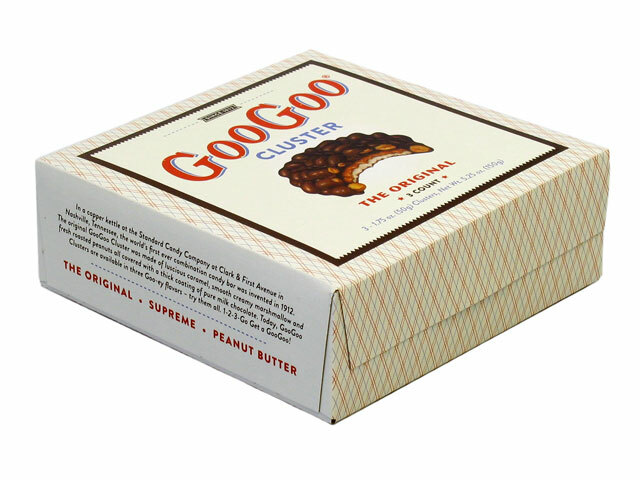 First sold in 1912 and claiming to be the world's \"first ever combination candy bar\", a GooGoo Cluster is a rocky mound of caramel, marshmallow nougat, roasted peanuts, and milk chocolate produced by Standard Candy Co. in Nashville, Tennessee. 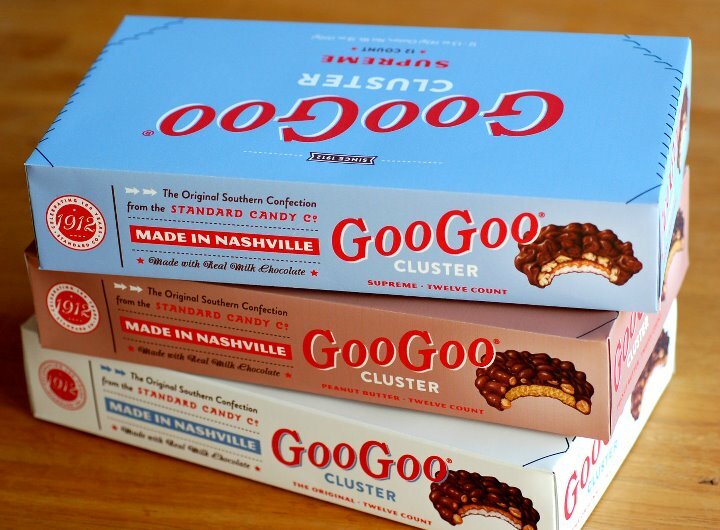 The GooGoos are as much an icon of the city as its music and have an app of their own to locate stores across Nashville that sell them. They are also quite popular in the Southern part of the U.S. with devotees as far North as Canada. 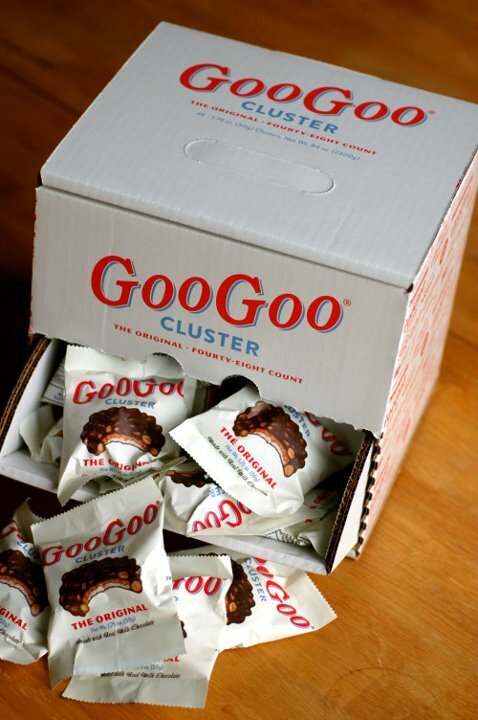 A logo and package redesign by Atlanta, GA-based Green Olive Media was introduced last year — as part of a larger effort that included spinning off GooGoo Cluster into its own company and a new recipe — but with the centenary of the candy in full swing, there is more GooGoo Cluster fever than ever.